Human Highway (Director's Cut) Trailer from Shakey Pictures on Vimeo. Here's the film trailer for Human Highway. 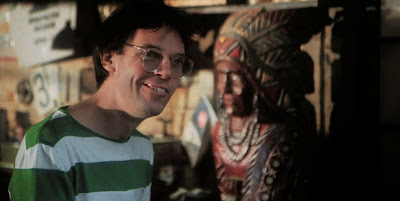 As we blogged recently, Neil Young's film Human Highway will have the director's cut version premiere at Toronto International Film Festival | TIFF.net in September. "Neil Young's mind-bending 1982 post-apocalyptic musical comedy, in which the rock legend writes, directs and stars alongside an eclectic and eccentric cast including Dean Stockwell, Russ Tamblyn, Dennis Hopper and Devo." Tonight, Saturday, August 16 at 9:00 PM EST, (~2 hours from now) the Thrasher's Wheat Radio Hour from WBKM.org will be streaming. Tonight's edition will feature concert highlights from the just completed Europe tour, dicsussion and news. Tune in details and podcast info @ Thrashers Wheat Radio Hour. then it got worst for Mr. Young before it got better. timothy - but isn't that the definition of a cut classic? Sometimes it really does take a Worried Man. Alot Of '80S Neil Is Classic Material. Hawkes & Doves,Trans, Reactor,Old Ways,Life,This Notes For You,Freedom. I Put Life On Today In My Car And Drifted Down The Road,it Brought Back Alot Of Memories Of The '86 Rochester,NY Show & The '87 Toronto Show. 1980 Neil Is Some Good Rockin' Music. Soldier Steve; Hawks n Doves and Freedom are my two all time favorites. It's the in between stuff that was poor. Yeah Timothy, Freedom Is One Of The Best Of All Time. Hawkes & Doves Is Great Too.Any Of Neils Albums With Ben Keith Are Legendary.Most Of Those Albums In Between 1980 & 1989 Are Good If You Give It A Listen Real Good.Tracks Like Opera Star,Surfer Joe,Shots,Like An Inca,Sample & Hold,Little Thing Called Love,Misfits,Bound For Glory,My Boy,Hippie Dream,Touch The Night,Violent Side,Long Walk Home,Around The World,Prisoners Of RNR,Inca Queen,Im Goin,Twilight,Sunny Inside,Cocaine Eyes,Heavy Love,Eldorado. Their Is Some Hidden Songs On Those Albums That Were Great Live And On Those Eightys Studio albums. But I Do Prefer To Listen To Live Neil Over Studio Neil Anyday.